"Careful attention to all costs generally means good profits can be achieved with a wide range of cropping systems." Cash costs involve actual cash transactions. Non-cash costs include expense items such as depreciation, which are not associated with an actual cash transaction. Variable costs increase (or decrease) as use increases (or decreases). Fixed costs remain constant as use increases. Fuel, seed, fertilizer and herbicide purchases are cash costs that vary with the number of acres farmed. Property tax is a cash cost that is fixed because it is incurred whether or not the land is farmed. Land charge is a non-cash cost of land ownership. Principal and interest payments are cash expenditures associated with land ownership. Land charge or interest, when used to estimate the cost of production, is the value of the land farmed times the rate of return that could be gained if the land were sold and the money invested elsewhere. Land charge is a fixed cost incurred whether or not a lien exists on the land and whether the land is farmed or left idle. Hired hourly labor is a cash cost that increases with the number of acres farmed or cropping activities performed. Self-employed and salaried labor is fixed because farmers have a certain cost of living that must be met regardless of how many acres are farmed. Self-employed and salaried labor is a cash cost that does not necessarily change with the number of acres farmed. Budgets on a per acre cost basis are a powerful tool for assisting farm management. A listing of inputs and prices helps estimate how much operating capital is needed for production. An estimate of the per bushel cost of production is useful in making effective marketing decisions. Crop share leases can be evaluated using the contributions attributed to both landowner and tenant in a crop budget. The economics of different systems, such as conservation tillage and no-tillage production, can be compared. Crop budgets are relatively simple for individual farmers to develop. They consist of listing various field activities and the inputs associated with them, along with prices, to arrive at an estimate of the cost of production. The step-by-step methodology allows for quick development and easy verification to see if the breakdown is accurate. Creating generic budgets to compare management practices. First, farmers are likely to differ on weed management philosophy. One producer may choose tillage as the major weed control method while another relies almost entirely on chemical control. Any two producers using predominately chemical weed control will choose different chemicals to use and apply them at different rates, depending on specific field conditions. Second, the machinery cost aspects of evaluating different tillage systems can be confusing. Estimating the cost of eliminating a particular activity such as disking may not be best represented by subtracting the custom rate for that activity. Rather, decision makers need to determine what will be the change to their financial situation. In other words, would eliminating a disking decrease their actual cost of producing a crop? And if so, how much? Overhead is hidden costs not easily accounted for in an operation. These costs are usually related to overall expenses of managing a business and not directly related to a specific crop enterprise (i.e. tools in a shop, heating the shop, etc.). Usually overhead costs range from 15 to 50% of a budget. The partial budget is the best budget tool to evaluate a change in farming practices. Partial Budgeting is the process of examining only those costs, returns and resource needs that change with a proposed adjustment. The costs, returns and resource needs of the business that are not affected by the proposed adjustment are ignored. This technique compares added revenues and costs of the proposed change (zero tillage seeding on all or part of the farm) with revenues and costs of the present practice. In order to compare the systems, you must know your farm operational costs, some fixed costs, and the potential returns from each practice. What is your yield potential? 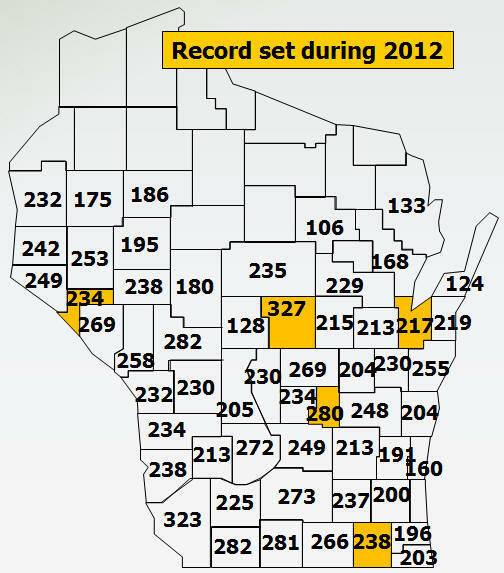 Highest recorded corn yields (bu/A) in Wisconsin counties (1983-2012). Data includes participants in the NCGA yield contest and Wisconsin PEPS program. How do you rank relative to other grain crop producers in Wisconsin? How Much Does It Cost To Produce An Acre Of Corn? How Much Does It Cost To Produce An Acre Of Corn Or Soybeans?